Innovative Engineering Inc, was hired by the Centers for Disease Control and Prevention to perform a façade Inspection of Building 18. Inspections of the exterior construction (including façade, roof, parapet), windows, lintel and sill, exterior doors and frames, exhaust stacks, gutters and downspouts, and traffic pavers were performed. As part of the façade inspection, IEI examined as-built drawings, conducted user interviews, and performed broad and close-up inspections of facades using rope access and bore scope examination. In addition to the inspection report, the CDC was provided a photographic evidence collection, cost estimating of repairs, and repair or replacement reporting. 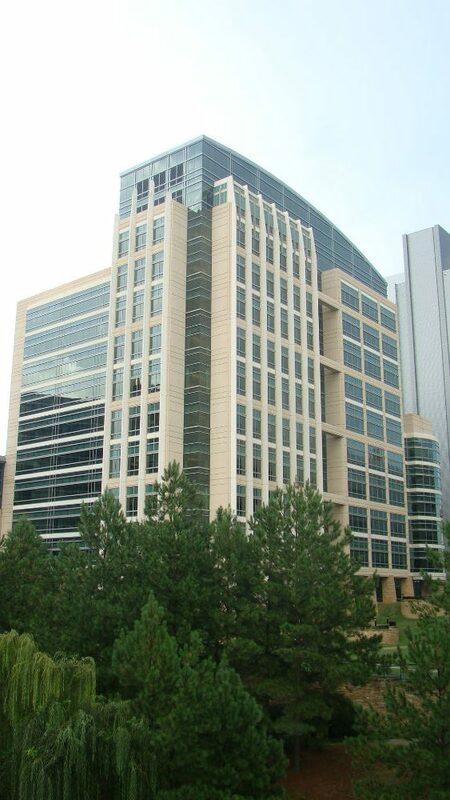 Building 18 was built in 2005 and is located on the CDC Roybal Campus in Atlanta, Georgia. It is located on the central portion of the campus adjacent to Building 15 and north of Building 17. Building 18 has approximate plan dimensions of 168 feet in width by 242 feet in length and is approximately 370,000 square feet. It is thirteen stories in height. Building 18 consists of a large tower, lower lab area, and a lower area known as high containment. The construction consists of post-tensioned concrete beams and a combination of reinforced cast-in-place concrete joists, beams, columns, walls, and slabs for all levels except the mechanical penthouse. The mechanical penthouse superstructure consists of structural steel beams, joists, and columns.